Have you heard? 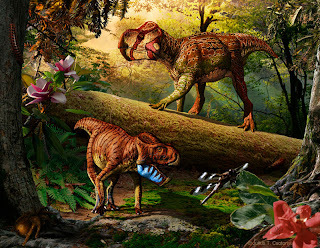 Two new basal neoceratopsids were discovered in Canada. Their names? Unescoceratops koppelhusae and Grphyoceratops morrisonii. They’re leptoceratopsids, a somewhat hazy-but-currently-monophyletic group of small-bodied, small-frill horned dinosaurs from (mostly) North America. 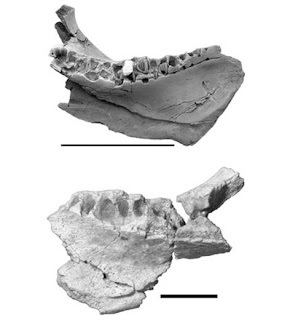 Unescoceratops was named based on a fragment of the left mandible. Originally regaled into the genus Leptoceratops, Michael Ryan realized it was unique. Gryphoceratops is known from a piece of lower right mandible. Among its interesting features is size: an adult would not have grown two feet long, making it one of the smallest—if not the smallest—adult dinosaur known. This is all well and good. It increases the diversity of the group and gives us information about the initial dispersal into North America. It’s also nice to find small dinosaurs, period: fossils of anything smaller than, say, a troodontid, is pretty hard to come by. Tiny things just don’t fossilize very well. Here are the mandibular fragments from both taxa! Wow, there's just not a whole lot there, but it hasn't stopped Julius Csotonyi from painting that beautiful life reconstruction of both animals (above)! Gorgeous thought it might be (and it is), one wonders what the utility of such a painting is, given that these two animals are known from...say it with me...fragments of the mandible in both cases. This painting is begging to be invalidated down the road. Oh, sure, phylogenetic inference can tell you something about the general form of these animals, but nothing specific: there's considerable morphological distance between, say, Udanoceratops and Cerasinops. It's a beautiful picture, but I have a hard time with the idea of painting an entire animal based on the most fragmentary of material. Excellent point... Not the first time this has been done before of course, but still no less true this instance.